For most travelers, flying isn’t a pleasant experience – long lines, terminals and concourses well past their prime, and of course, old and dirty planes. As you sit in your cramped seat with limited recline, listening to flight attendants directing you to push your seat back upright, stow your tray table, and turn off your in-flight entertainment, you wish there was a better way to fly. Well there is… except most of the general public can only dream about the unbelievable ways of air travel we’re about to describe. 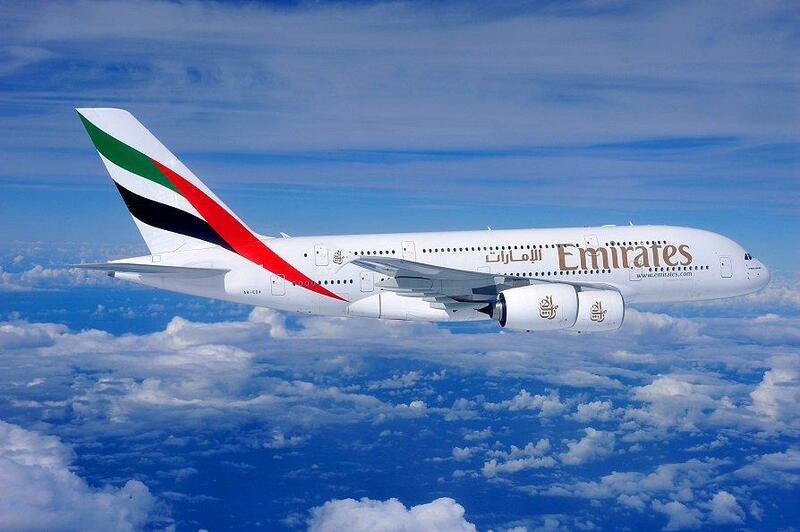 Emirates Airlines, based in Dubai, is regarded by many as the most luxurious carrier in the world. Founded in 1985, it is also one of the largest airlines both by passengers carried and by revenue, as well as the largest operator of the Airbus A380 – the world’s largest passenger airliner. Noticing a trend? Meanwhile, Etihad Airways, based in Abu Dhabi, is one of the newest operators of the Airbus A380, but sent shockwaves through the industry when details of their new premium class designs on the flagship Airbus were released. Their top tier product, The Residence by Etihad, is perhaps the most luxurious and over-the-top product in commercial aviation today. Despite their airport hubs being only an hour apart from each other and located in the same country, both airlines have created some of the most eye-popping First Class seats in the world. Perhaps there’s a bit of sibling rivalry boiling under the cordial exterior? So now let’s get to the heart of the matter, the crux of the issue, the meat and potatoes… who truly has the best First Class experience – Emirates or Etihad? In order to settle this burning age-old question once and for all, we sent two lucky LoungeBuddies to the Middle East (at their own expense, of course) to uncover the answer. Arguably the most important aspect of international First Class is the seat. 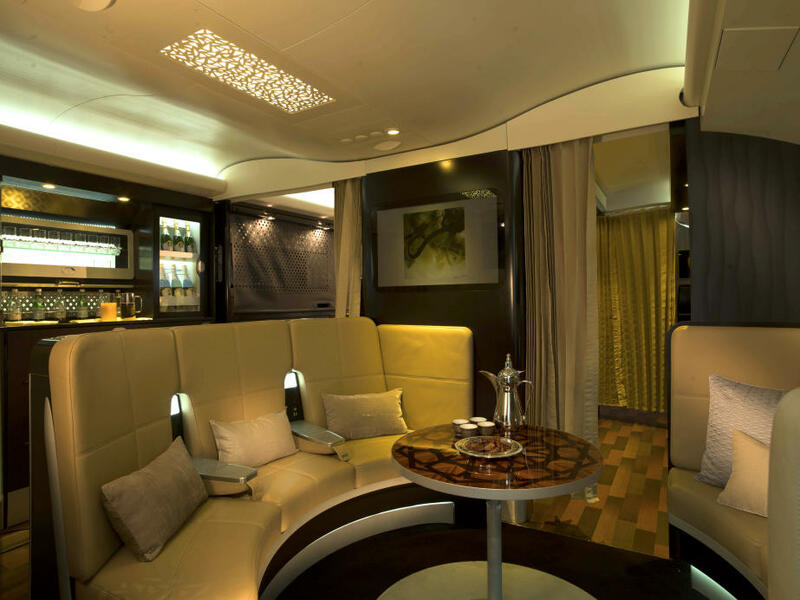 Forget the cramped and uncomfortable torture devices found at the back of the bus, since Emirates First Class is configured with only four suites per row. Compare that to the 10-across seating typically found in the Airbus A380 Economy cabin (though in all fairness, if you’re going to fly coach, the A380 has some of the widest Economy seats in the sky). Etihad, having balked at the thought of placing four First Class suites in one row (the horror), instead decided to configure their cabin with only two First Class suites per row. Much better, no? Both are equipped with shoulder-height privacy doors that can easily be used to block out other meddlesome First Class passengers, making it feel like you truly have your own private room in the sky. No more having to deal with unnecessary human contact. On Emirates, you can even electronically control the privacy doors from a tablet at your seat – because using arm strength to close your suite doors is just so 2008. I mean, who would want to have to put on slippers, get up, and shut the doors manually when you’ve finally gotten comfortable in your First Class bed? Seriously. The Etihad Suite is equipped with Poltrona Frau leather, the same material found on high-end automobiles such as Ferrari and Alfa Romeo. With both a seat and an ottoman as wide as a park bench, it’s easy to throw a party in your suite with other First Class passengers. In the event of turbulence, there’s no need to stop as both seating surfaces are equipped with seat belts. Clearly, two suites per row is much better than four, and most First Class travelers need the extra room to spread out… particularly if you’ve invited a guest (or four) to join you in your suite. Even Emirates’ automated privacy doors can’t challenge that. On Emirates, the seat turns into a fully flat bed with a 180-degree recline, again, at the touch of a button on your tablet. Etihad takes it to the next level by creating an entirely separate bed using the ottoman in your suite, allowing the bed to be made without having to sacrifice your seat. And if there’s one thing First Class passengers hate, it’s sacrifice. If you have a significant other traveling with you, certain rows of the First Class cabin allow you to lower the divider located between suites. The one thing you can’t do is create a full double bed, as the partition retracts only near the head. 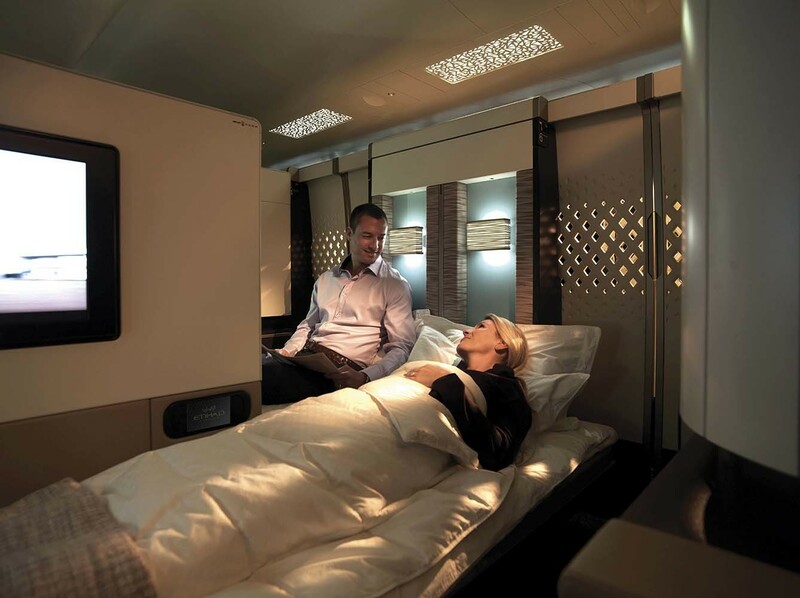 If you truly desire a double bed, you’ll need to upgrade to The Residence by Etihad for only an extra $10,000 USD. Both First Class seats are impeccably designed, although they differ in significant ways. Imagine rich gold plating, plenty of bling, and heck, even a small table lamp on the console of your suite. 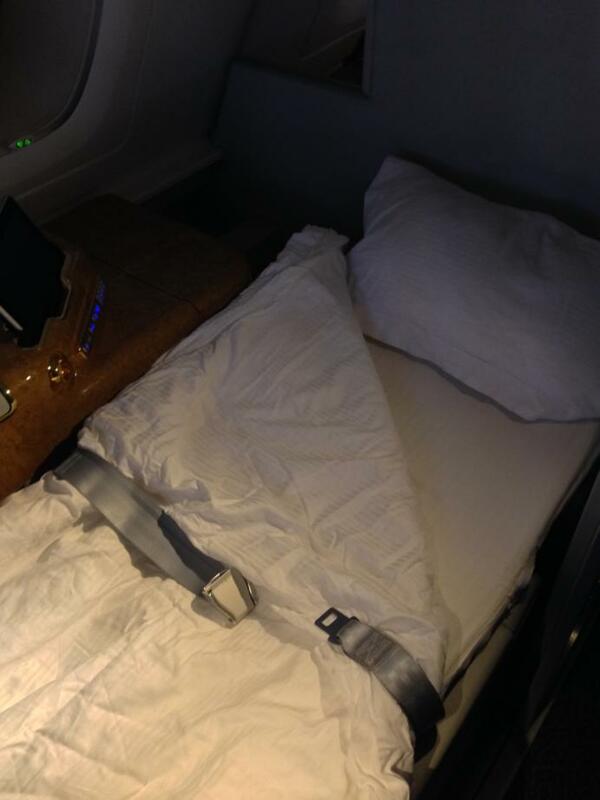 That would be what you’d expect and receive on Emirates. 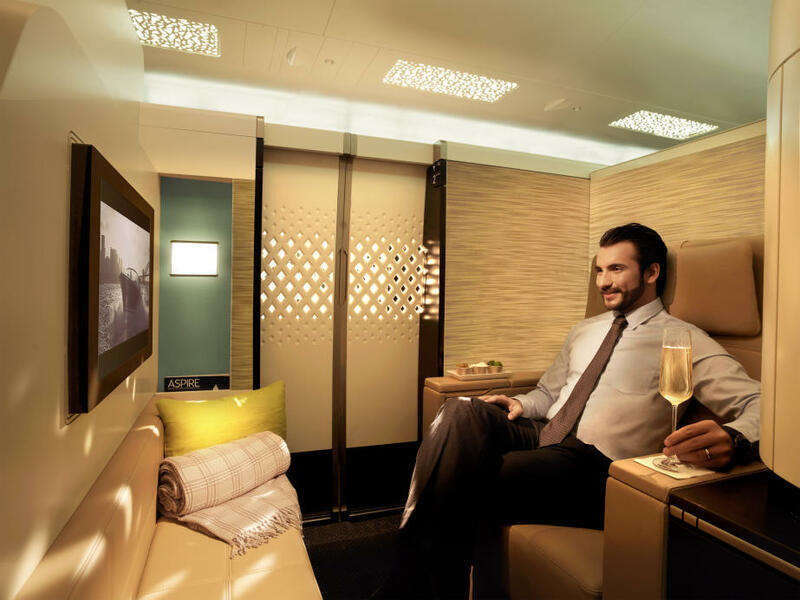 Etihad, on the other hand, uses refined Arabic decor to subtly include their heritage, while also incorporating the most modern Western design elements. 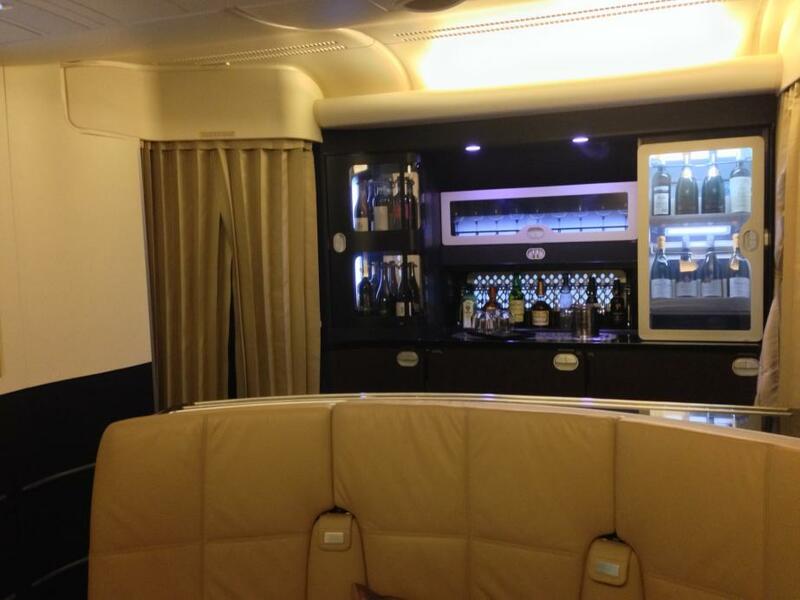 If you want to fly like a wealthy Arab Sheikh, Emirates would probably be your style. 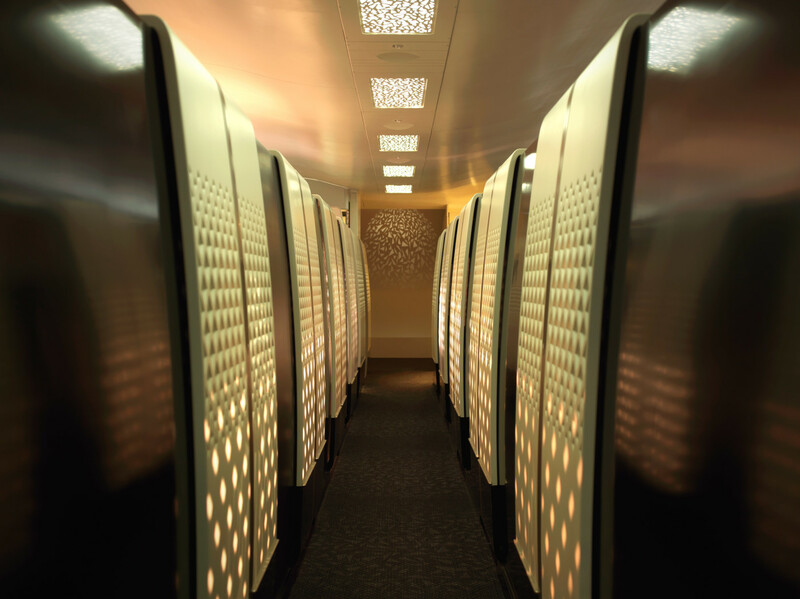 Otherwise, you’d be better off sticking with Etihad, which has a more subtle, but sophisticated, suite design. What kind of First Class passenger wants to get up to wait as their bed is made? When it comes to airline food, few of us would say they enjoy pre-cooked meals served on plastic trays. 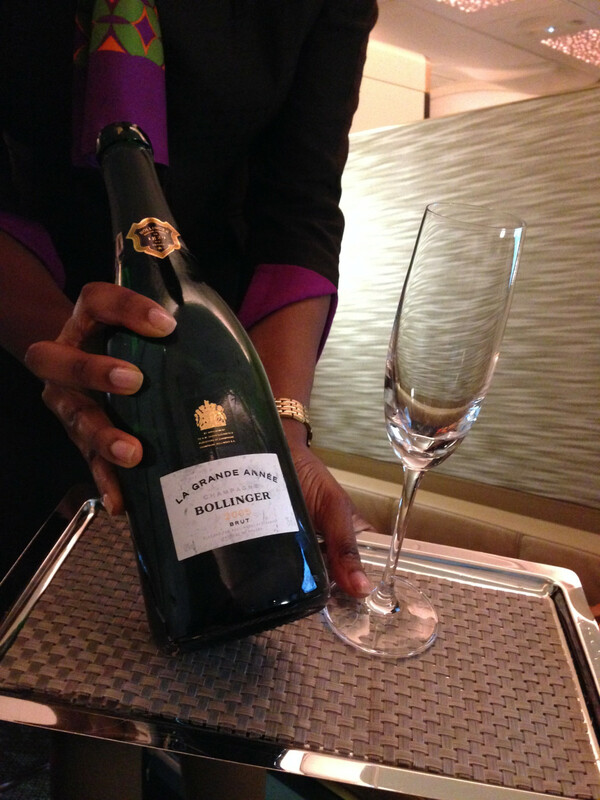 For those traveling in international First Class, however, it’s a completely different story. Emirates and Etihad offer meals like you would find in a Michelin-starred restaurant. Caviar and Arabic mezze are staples of the Emirates menu, in addition to a list of items stretching as long as the menu at the Cheesecake Factory (but with edible food instead). You won’t find prices or any number signs listed beside the menu descriptions either. Everything is complimentary, as expected in First Class. Etihad takes the concept of airplane food even further by having a dedicated chef on board. Imagine a gourmet meal, customized to your liking, presented on fine bone china, served with premium alcohol, on a plane, in the sky, rocketing at 550 miles per hour. Truly mind-boggling, to say the least. One of Etihad’s specialities is their “From the Grill” selection. 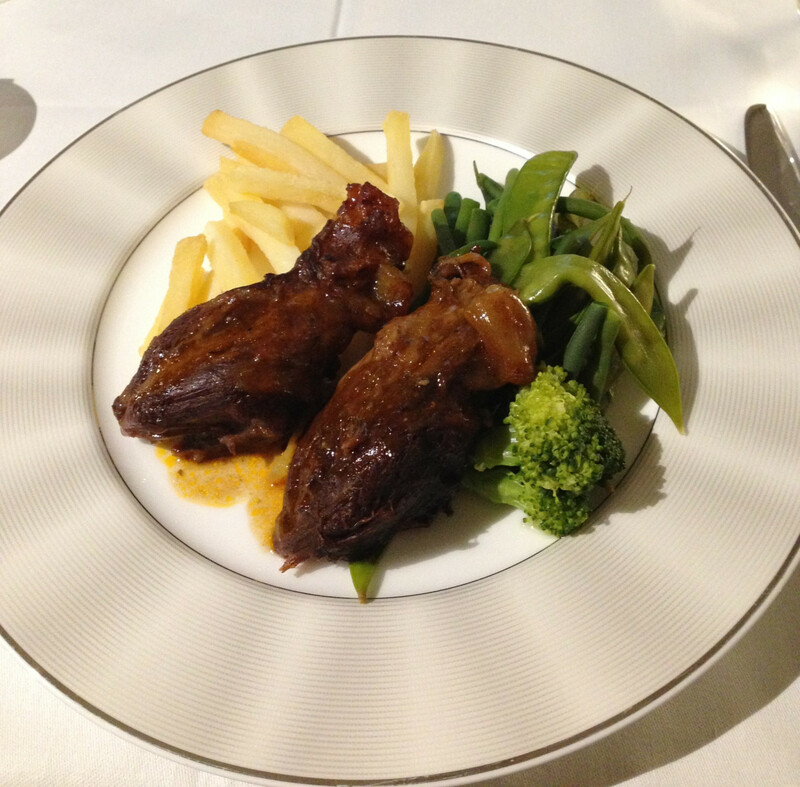 Instead of mystery meat, First Class guests have a choice of five meat options, including lamb shank, rib eye steak, and a seafood option. Want fries on a plane? You can have that too. There are also six side options and four selections of sauces, making it a total of 120 possible combinations in all. Care for something on the sweeter side? 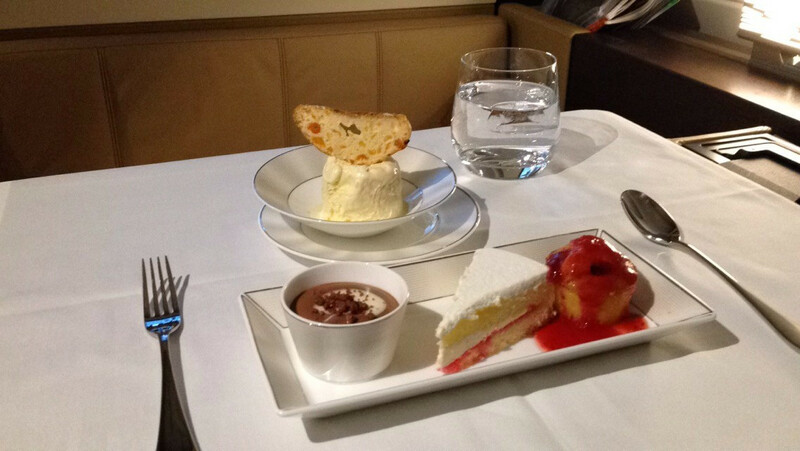 Whether it’s ice cream, pudding, or cake, Etihad has you covered – like decadent raspberry sauce. No discerning First Class passenger wants to eat an identical cookie-cutter meal as the rest of the cabin. Etihad’s in-flight chef concept makes it easy for you to customize your meal. After collapsing from the weight of your First Class meal and plenty of alcohol too, you wake up covered in First Class grime (yes, it’s a real thing). Think unfinished glass of Dom, crumbs from your creme brûlée, and a few stains from that 40-year aged port you were dying to try. What better way to wash off the mess than with a hot shower? Both Emirates and Etihad have two showers at the front of their cabins. However, in the all-important category of shower-to-passenger ratio, Emirates wins, with one shower for every seven passengers, while Etihad only provides one shower for every nine passengers. 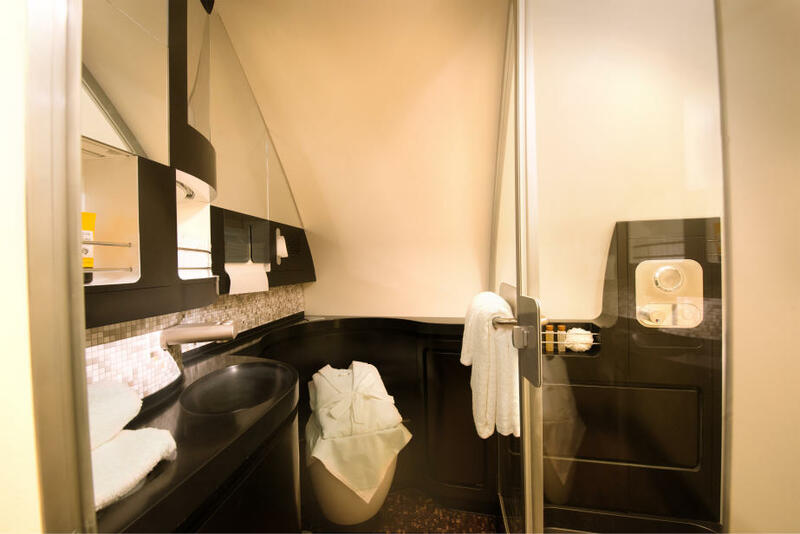 It looks like Etihad had to make the difficult decision of having First Class passengers potentially wait for a shower, all because The Residence royalty needed their own private shower. 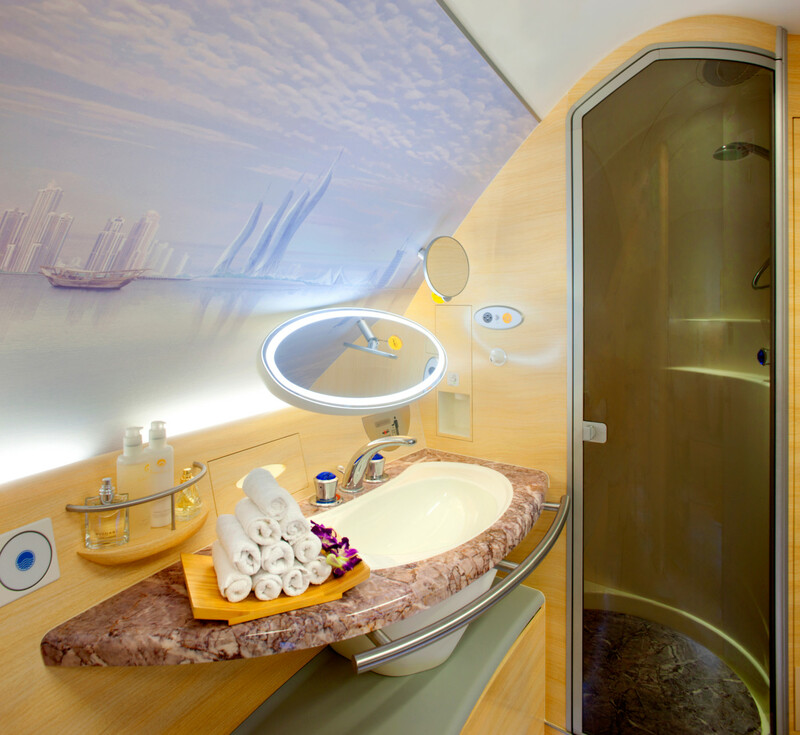 Most travelers who’ve flown in both cabins believe that Emirates’ showers are more pleasant, with adjustable heated floors, and a panoramic wallpaper view of the Dubai skyline. There are few things more novel on a plane than having the ability to dance around in a space big enough to do cartwheels, in front of the Dubai Skyline, in your bathrobe! Both airlines have everything you need for the complete shower experience, including toiletries and a hair dryer. Emirates has two varieties of their Timeless Spa toiletries – relax and revive – depending on the time zone you fall into (which, incidentally, is also a critical factor for deciding on when to start drinking). For those First Class passengers with discriminating taste, Etihad offers New York City-based Le Labo toiletries. 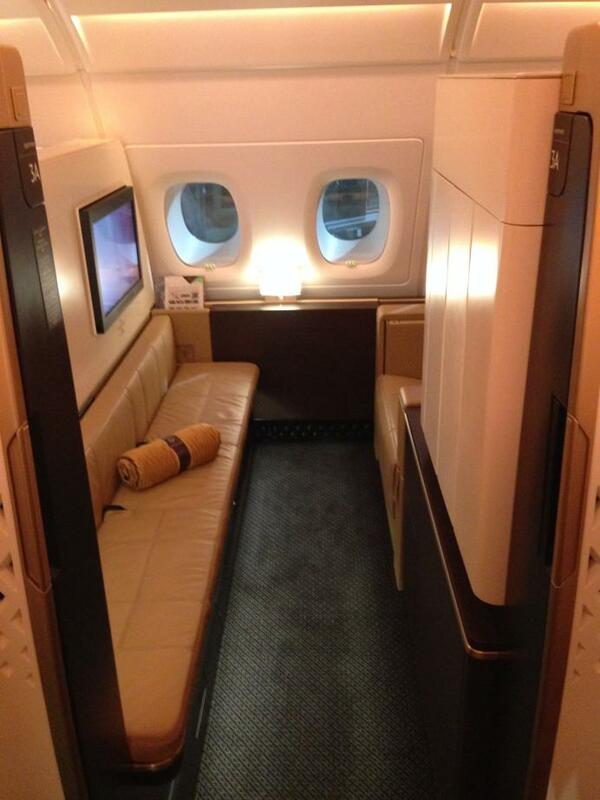 Winner: Emirates First Class passengers obviously need their space while showering. For that, Emirates takes the win. Now fresh from your in-flight shower, you suddenly have a desire to socialize (or empathize) with your unfortunate friends who are experiencing the horrors of Business Class. While you can reach them through the in-seat chat, Emirates and Etihad also makes it possible for passengers from Business and First Class to congregate in a social area with no Economy plebeians to contaminate the refined environment. In case your suite wasn’t big enough, the lounge should give you ample room to stretch your legs. Both Etihad and Emirates situate their lounges on the upper deck. The Etihad Bar takes a page out of luxury hotel lobbies. Hence, its designation as “The Lobby”. With ornate seating situated about a round table, you can chat with friends or plug in your headphones and watch in-flight entertainment from your seat. Sadly, even in First Class, you’ll have to have your drinks refilled from the display case, rather than an actual bar area. Luckily, if you prefer a more traditional bar experience, you’ll find it on Emirates. The Emirates Bar epitomizes the golden age of travel, when Boeing 747s had onboard lounges (sans piano player and cigarette smoke) with extensive seating, elegant lighting, and a horseshoe shaped bar to allow for passengers to mingle. Worried that the booze selection won’t cut it? Just tell your bartender what you want from the First Class menu and he or she will bring it out to serve you (and perhaps your new BFF from Business Class). First Class passengers who need a place to stretch out want a different environment from their seat. 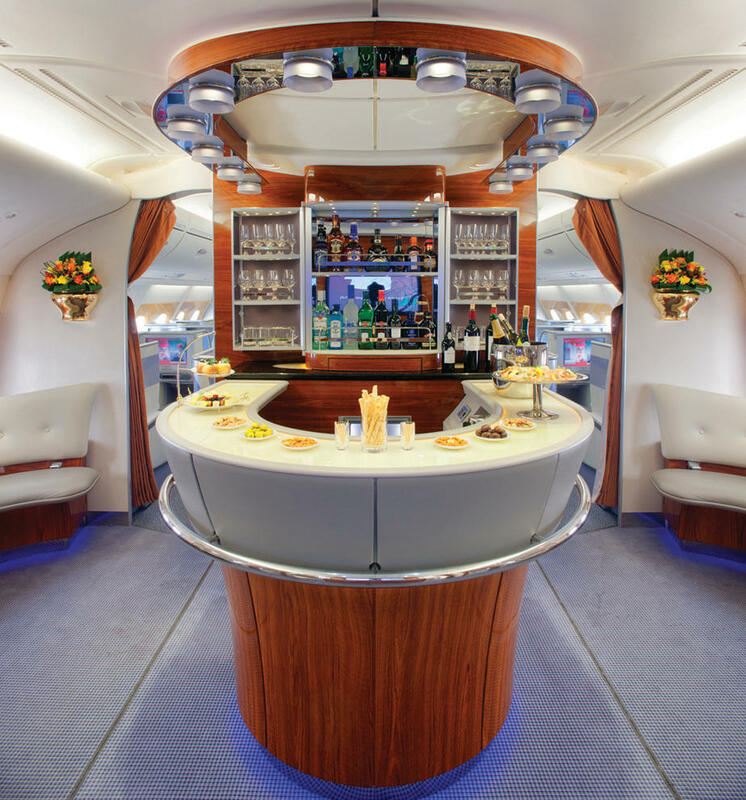 Emirates achieves this atmosphere with their onboard lounge, featuring comfortable seating, cocktails, snacks, and even a flight attendant manning the bar. Although the UAE is a country based on Islamic Law with stricter alcohol regulations than Europe and North America, Emirates and Etihad both have complimentary top-shelf alcohol for those who are above the age of 18. Not a fan of the swill that domestic carriers often serve? 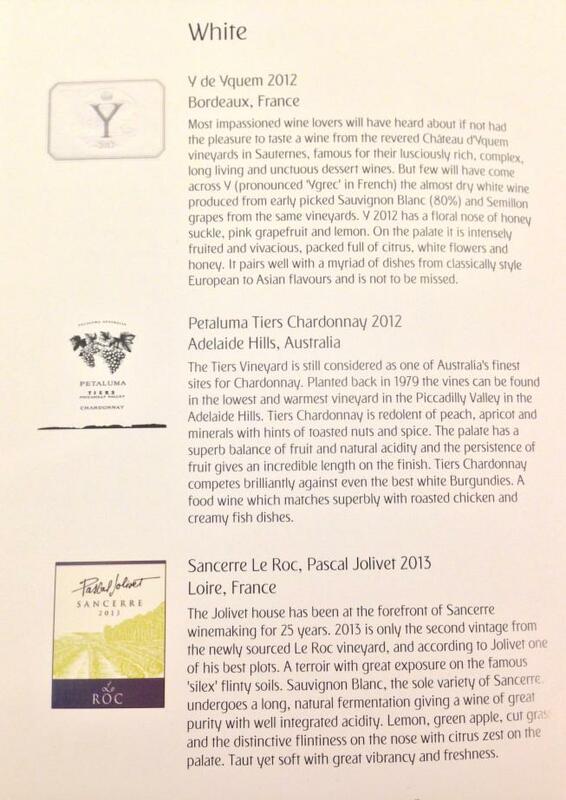 Both airlines offer a wide range of New and Old World wines, with options from the United States, France, Australia, and more. Each selection is printed on the wine list handed to you at the beginning of the flight, along with a description longer than anything you’d care to read once you’ve had a few glasses. For those who do enjoy excruciatingly detailed wine descriptions, including grape varieties and their region of origin, feel free to savor every printed word on the elegant menu. If other types of alcohol are your fancy, feel free to choose from a vast range of spirits, liquor, and champagne, include Johnnie Walker Blue Label, Dom Perignon, and Bollinger La Grande Année Vintage. Worried about plastic cups diluting the taste? No need to worry, because proper crystal glasses are always served. 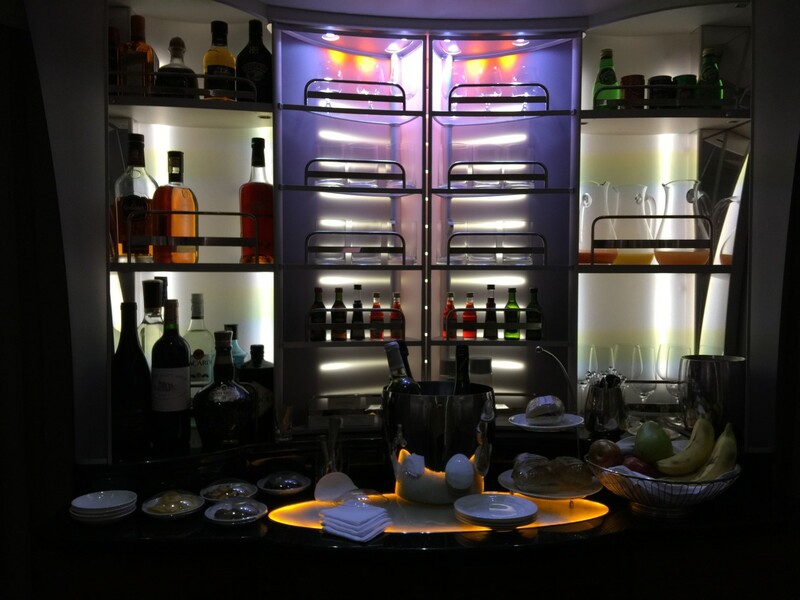 Both airlines offer great alcohol, but in terms of brand and cost, Emirates takes the cake, with plenty more drink options breaking the $100 USD per bottle ceiling. They are also the only airline serving Hennessy Paradis Cognac in First Class. With a retail price hovering around $700 per bottle, it is the most expensive liquor available on any carrier – equivalent in price to what most Economy passengers pay for their entire return ticket. I’m sure we all have the same opinion on which option is better. Don’t want to wait for your drink? 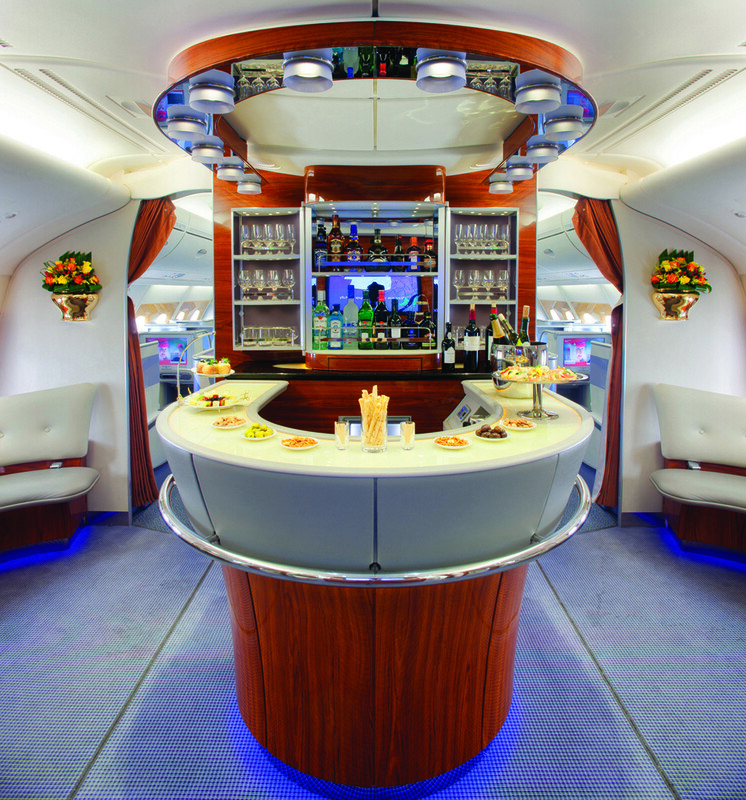 First Class passengers on Emirates can help themselves to all the alcohol they can drink from the First Class bar. As a First Class passenger, only the most expensive and premium alcohol will do. On those 13+ hour flights from North America to the Middle East, having to sit in a metal tube gets boring fast. If having a gourmet meal, socializing at the onboard bar, and having a shower isn’t enough, First Class passengers also have fantastic entertainment options to whittle down the hours of their flight. 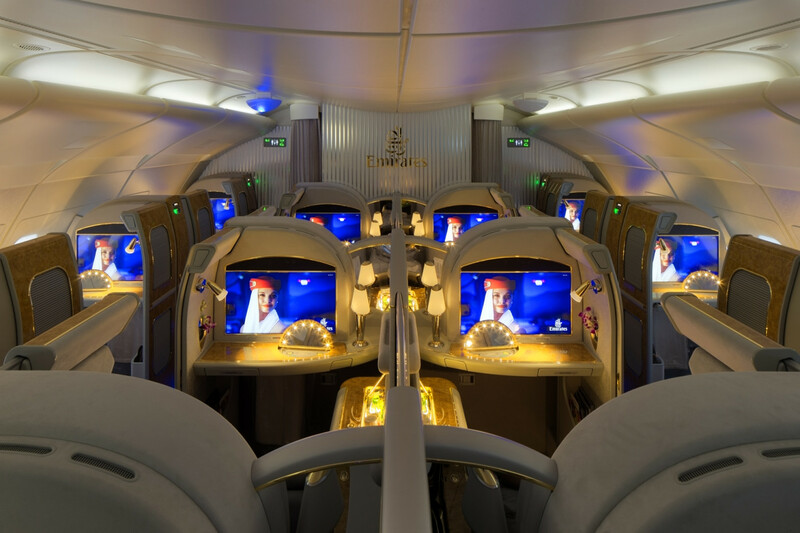 Both Etihad and Emirates First Class suites on the Airbus A380 have screens at least twice the size of those at the back of the bus, featuring a wide variety of content from around the world. If that isn’t enough, you can surf the web with your smartphone or laptop using their satellite-based WiFi systems. 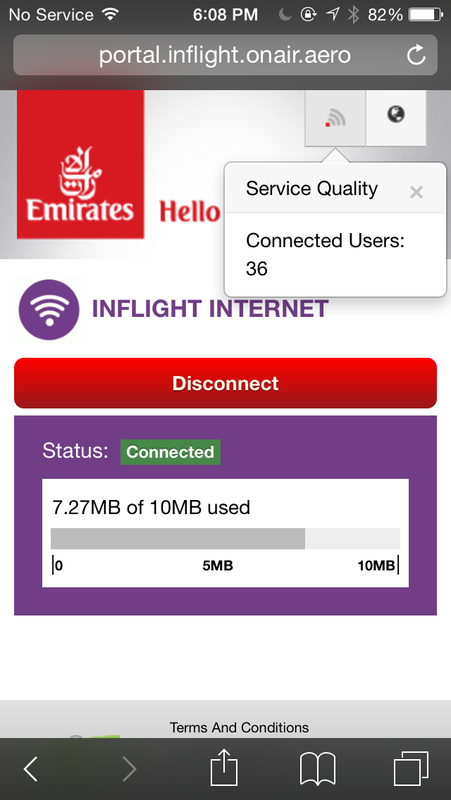 Emirates has gone the route of making WiFi affordable for everyone – free for the first 10 MB and only $1 USD for 500 MB of data. Unfortunately, this also makes the internet connection virtually unusable due to the sheer number of passengers logged on to the network. 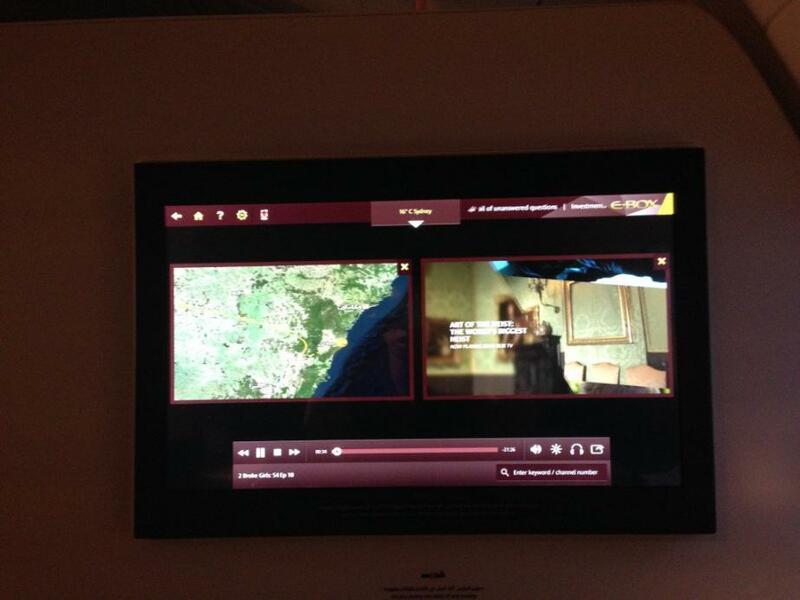 If you just want to disconnect from the online world, Etihad has the superior entertainment system. The screen not only pulls back to let you watch TV in bed, but it also has split-screen capabilities if you want to mix both work and pleasure by streaming two kinds of content at once. 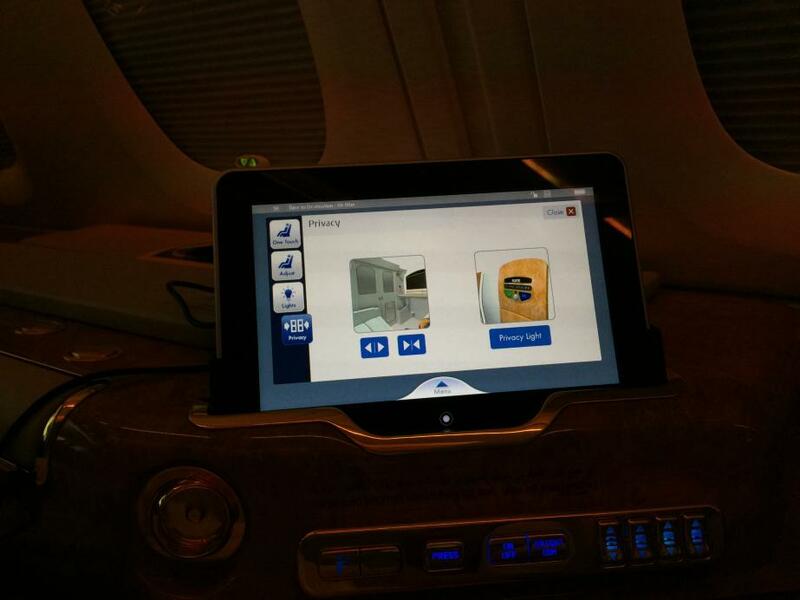 On top of that, Etihad has two touchscreen controllers for the in-flight entertainment, allowing you to choose your next selection while still watching your current movie. With the other controller, you can also watch the skies with the tail camera, or track your position with the interactive flight map. Being able to watch content on four different screens while surfing the web will definitely entertain any First Class passenger. 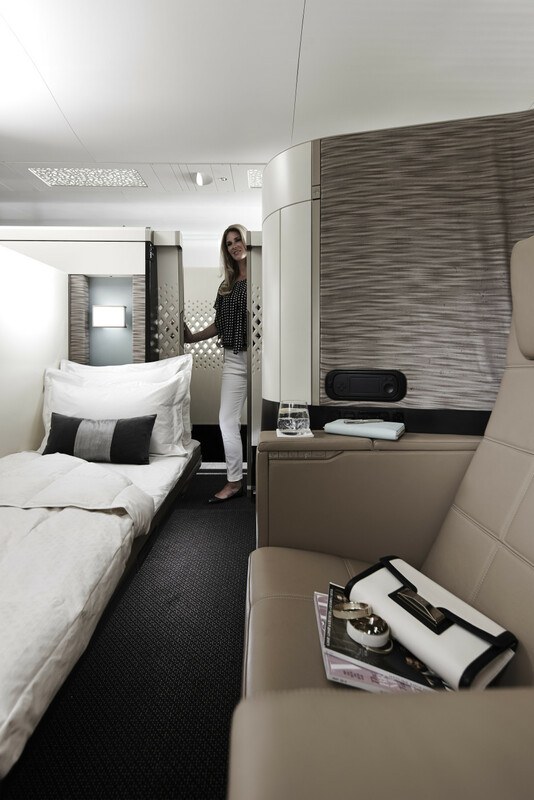 With the list of First Class components we’ve evaluated, Etihad wins in four of the categories, while Emirates wins in three. Ultimately, it’s a close race. If we examine each specific category, however, the results are more telling. 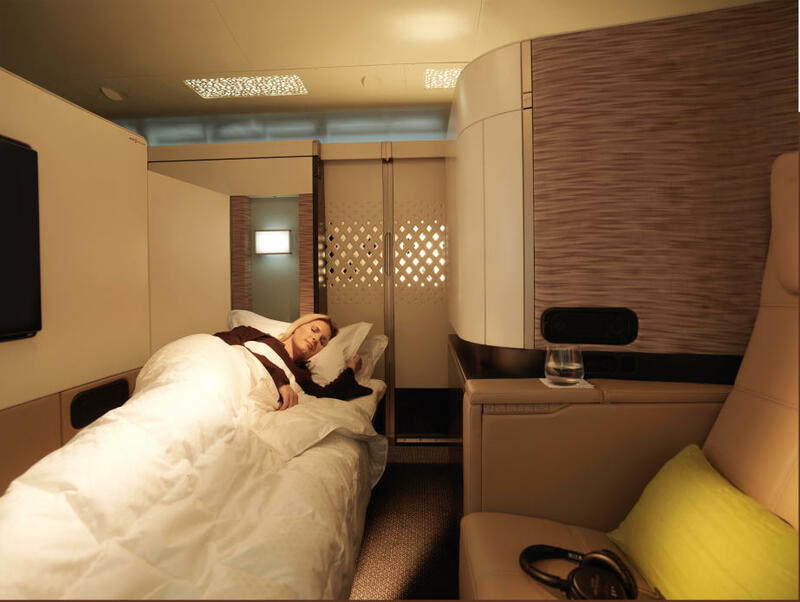 Etihad has the better suite, bed, entertainment, and food – all the essential components of a flight from a typical perspective. However, Emirates has a better shower, onboard lounge, and alcohol – things that display the full extravagance of being in First Class. At the end of the day, both products are luxurious and over-the-top in their own unique way, and are sure to satisfy the sophisticated taste of any First Class traveler. 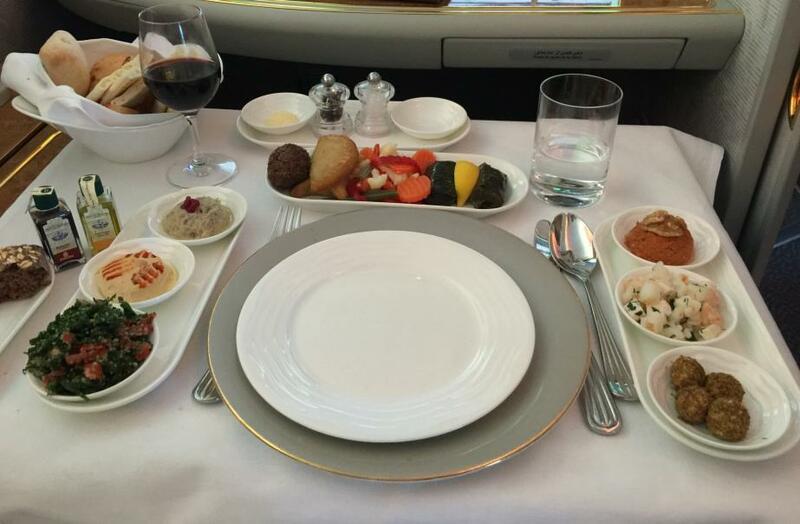 HOW CAN I TRY EMIRATES AND ETIHAD FIRST CLASS? 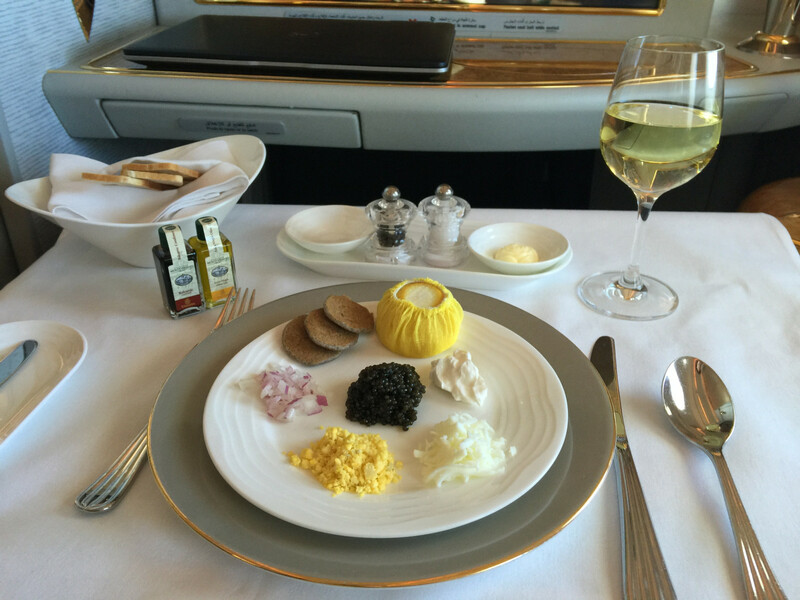 Thinking about purchasing a First Class ticket on Emirates or Etihad out-of-pocket? Typical Dubai or Abu Dhabi to London flights will set you back approximately $8,000 – $9,000 USD minimum. Not part of the 1% but still want to experience life at the nose of the plane? A much more cost effective way, of course, would be to use miles and points. 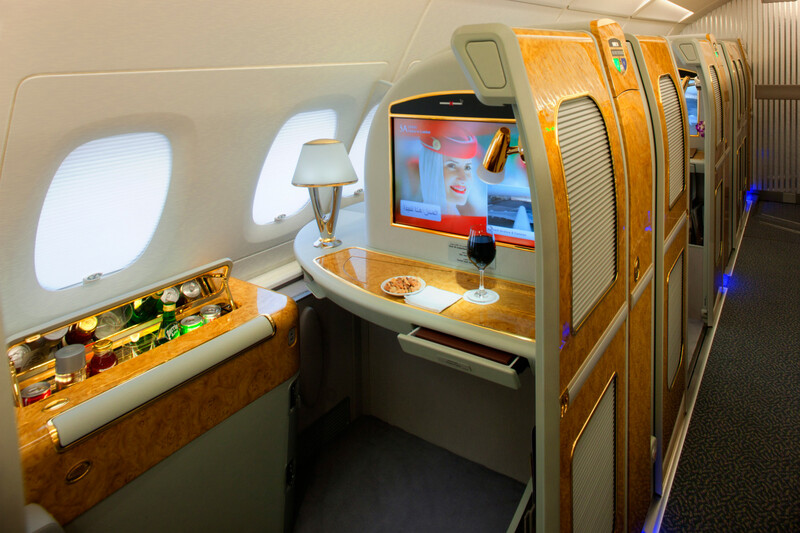 For Emirates, the best way to redeem for First Class flights is through Alaska Airlines Mileage Plan. With no fuel surcharges to pay for and extremely reasonable award charts, it takes some flying on Alaska Airlines or a few approved Alaska Airlines credit card applications to earn enough miles for a shower on Emirates First Class! Another redemption option is to transfer your Starwood Preferred Guest points to Japan Airlines Mileage Bank, and redeem those miles for Emirates First Class. Japan Airlines has a distance-based award chart and no fuel surcharges. However, note that redemptions cannot be made online. Want to learn about more crazy ways to use Starwood Preferred Guest points? Read our blog post 10 Insane Ways To Blow One Million Starwood Points. Luckily, Etihad is a partner of American Airlines, and AAdvantage miles can be redeemed directly for Etihad First Class flights. With Middle East to Europe awards in First Class starting at just 40,000 AAdvantage miles one-way, it doesn’t get much cheaper to experience your own private suite in the sky. The best ways to obtain AAdvantage miles are by flying AA or a oneworld partner, through signing up for and receiving credit card bonuses, or by transferring them from the Starwood Preferred Guest program.